We have a new family member - for one week only. 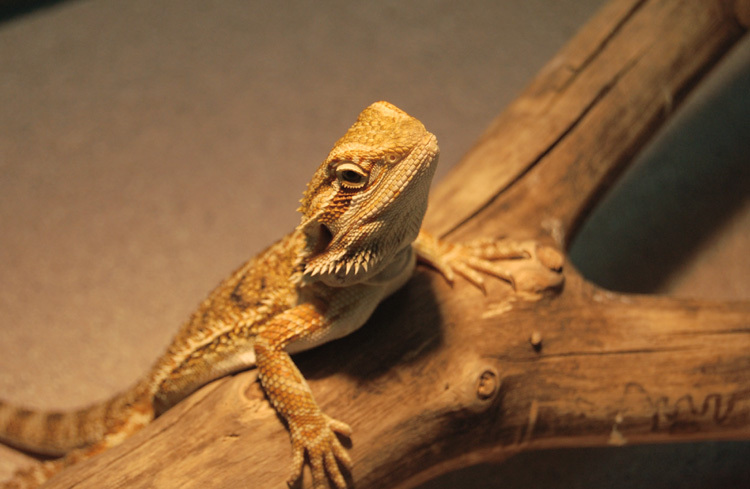 Meet Storm E. He is a bearded dragon who has come to stay with us for a short time while his family is on vacation. This is about as close to pet ownership as I want to get at this point in my life and I admit it has been fun. I had never spent much time around lizards and I have to say, they do seem to make really good pets. They are quiet, interesting, they don't stink or bite and they seem to have a bit of personality. Okay, I'll just say it - I might - might be a tiny bit sad when it's time for him to go. There, I said it - but don't tell my boys or my husband who all have a pretty bad case of pet fever right now. And yes, work on holiday prep continues. I don't post about it much because I don't imagine anyone cares about my stocking up on mailing envelopes and embroidery hoops or even the trial and error and guesswork of designing this year's ornaments. You know how unsure I get about these things and my frantic indecisiveness can be kind of embarrassing so I probably shouldn't share all that. I do know that the snow angels are coming back for another season and I am actually still making color and stitch choices on the rest. If I am posting photos of lizards - one that doesn't even belong to me - you can tell that my blogging superpowers have taken a kryptonite hit lately, I know and I apologize for that. A fellow embroiderist who I really admire, Kelly Fletcher, recently wrote a blog post about the challenges of blogging and tackling big embroidery projects. I thought it hit the nail right on the head. You can check it out on her embroidery blog. I love Storm E. He is super cute!! We have gecko named Geico and I'll have to tell you that they are easy peasy pets to own. :o) *wink ~~~ I'm going to head of to Kelly Fletcher's blog and check it out. I agree with Amy, Storm E's a cutie! Very handy to be able to try out what it'd be like to own one ;-). ===I don't imagine anyone cares about my stocking up on mailing envelopes and embroidery hoops or even the trial and error and guesswork of designing this year's ornaments=== I actually *do* find that kind of stuff interesting, but then I also have a tremendous love for the "behind the scenes" extras on dvds. In general, I'm pretty fascinated with the "how" of things, not just the end result. Surely I'm not the only one...!! And I can relate to the frantic indecisiveness. You wouldn't believe how many times I catch myself in one of those moments and think, "oh my goodness Glenda, just decide already! "...and how many times I end up postponing making a decision. What is that about??? My indecisiveness seems to be for smaller decisions and/or things for which I don't have a deadline. Should I buy this shirt or pair of shoes or that one? Which embroidery pattern to stitch up, on which fabric, with which colors, with which stitches? Which paint color for the walls? But give me a decision for which I can make a definite "pros vs. cons" list or a decision with a firm deadline and there's no hesitation. So I'm good when I'm not allowed wiggle room for waffling ;-).